Weird is a difficult thing to aim for. It’s one thing if a creative work generates an outré and off-center aesthetic by serendipitous accident or opaque genius. But executing so that something feels loopy is much harder if an entire audience knows that’s where you’re trying to wind up. It’s the problem that’s staring right in the face of the newest version of Doom Patrol. 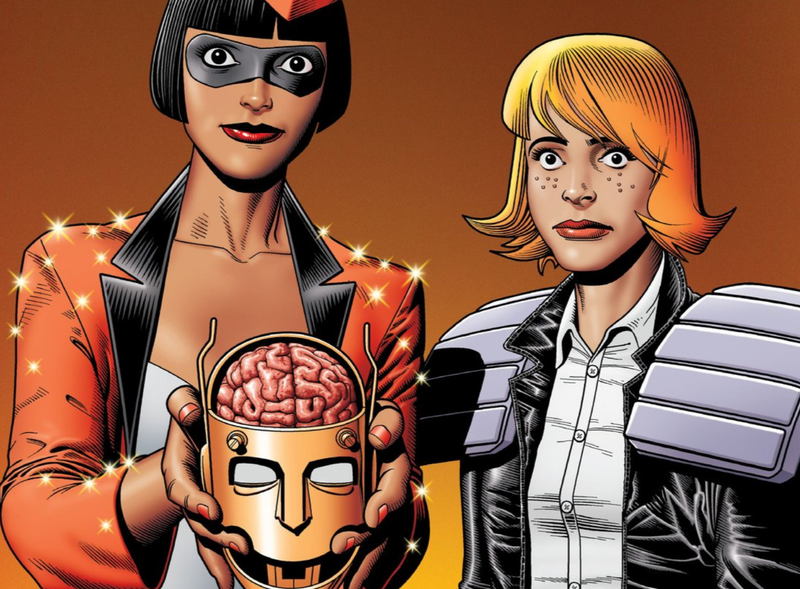 The problem with Doom Patrol is that it was never supposed to have a legacy. When the team first appeared in one of DC Comics’ non-descript anthology titles decades ago, their popularity took folks by surprise. The miserable, self-loathing affect of characters like Robotman, Elasti-Girl and Negative Man made them stand apart from square-jawed paragons like Superman. That tone, combined with goofy enemies who were machine-gun-toting gorillas and disembodied brains, turned them into a cult curiosity in the publisher’s stable. The various re-imaginings that the team has undergone have either doubled down on the fringe flavoring—as with the legendary Grant Morrison and Rachel Pollack runs—or ignoring the weirdness for straight-ahead superhero stylings. The most radical re-invention that the Doom Patrol got in recent years was an attempt at making them more “normal.” But that’s not what’s happening this time. Doom Patrol #1 is more than just a first issue of a new series. It’s also the debut of Young Animal, a pop-up imprint from DC Comics where the titles and talent have been chosen and curated by musician Gerard Way. The mastermind of now-defunct alt-rockers My Chemical Romance has had a lifelong relationship with comics, including an internship at DC in his younger days. It makes a cyclical kind of sense that Doom Patrol is the flagship book for Young Animal, as Way is an avowed acolyte of both Grant Morrison and classic old-school Vertigo Comics. The action in this first issue—written by Way, with art by Nick Derington, Tamra Bonvillain, and Todd Klein— starts by introducing young EMT Casey Brinke and her partner Samson as they hastily shuttle an elderly man to an emergency room so he can keep on living. Right away, Casey’s inner monologue reveals her to be an energetically determined sort of quirky, but she’s grounded by work responsibilities and everyday concerns. Things explode right in front of her multiple times in this issue and her reactions are concern and glee. The fact that she doesn’t recoil in horror on seeing Robotman shattered to pieces after getting hit by a garbage truck means that she’s going to deal reasonably well with whatever comes next. Niles Caulder, Robotman, Danny the Street, and the signature Doom Patrol characters you came to see are here... but they’re also not. The narrative flits around willy-nilly going from an existential consideration of what life might be like inside a gyro to Robotman fighting a micro-sized army that want to kill a fly on the aforementioned gyro to a hotel meeting of businessmen not of this world. Digestible plot causality is a secondary consideration here, and the puzzle pieces thrown at readers are meant to flood synapses and broaden horizons. You’ll understand it all eventually but don’t try so hard right at the outset. If there’s been any motto that ties the various Doom Patrol mutations together, it’s probably something like, “to live through trauma is to change with the times.” The Doom Patrol are heroes for a mutating world. They’re not supposed to come back the same as before. This new attempt at Doom Patrol gives readers just enough by way of graspable anchor points to grab their attention, while also indulging in lyrical psychedelia, quick-cut glimpses of recognizable characters, and satires of late-capitalist awfulness. Way knows you’re here for weird. The bizarre carnival that he and his co-conspirators are building might be dusting off and re-purposing the bones of Doom Patrols past, but it’s also shrugging off nostalgia in favor of an all-new umami. This is a self-aware slice of off-the-wall superhero pizza, served out of an establishment that you’ll probably want to come back to.